A delighted Tyson Fury insisted that he always knew he would beat Wladimir Klitschko after producing one of the biggest shocks in recent heavyweight his­tory. Fury, who was a 5-1 underdog before the fight, proved too quick and elusive for the 39-year-old now-former world champion, before winning a unanimous decision by 115-112, 115-112, 116-111. Afterwards the new WBA, IBF and WBO champion told reporters: “I always said what I’d do and I’ve delivered tonight. I didn’t have this confidence for nothing. I knew I could come here and upset the apple cart. “I knew all along I could win the fight. Wladimir knew, his whole team knew tonight. I saw in his eyes he knew he was going to lose the fight and he saw the new, hungry champion in me. Fury admitted, though, that he thought the fight was close – and that he feared the worst when he lost a point in the 11th round for repeatedly hitting Klitschko around the back of the head. “It’s hard to come to Germany and get the decision,” he said. “With that point off I thought he had got it. He kept turning around, turning away and pushed me down. But I would just like to say to Wladimir and I would like to say to Germany thank you for having me. 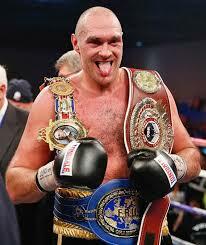 Fury’s trainer Peter said that his mental skills had made the difference. “Boxing is an art, it is not just about a one-punch KO,” he said.